Caldwell can supply a range of sash locks in virtually and style, RAL or anodised colour, and a variety of finishes, meaning we can supply suitable sash locks for virtually any project. As a specifier, fabricator or designer, our wide range of locks means you can choose from both traditional and modern designs, but also specify to exact levels of security and aesthetics. For modern new builds, sash locks can be supplied in bright and vibrant colours, whereas for renovation projects, we can supply sash locks more suited to traditional appearances. 9400 and 9600 sash locks: Featuring a sweeping cam which simultaneously pulls the keep towards the lock, and pushes the keep upwards for a secure seal at the window’s head, the 9400 and 9600 locks can provide a sash lock which is not just secure, but also weathertight. 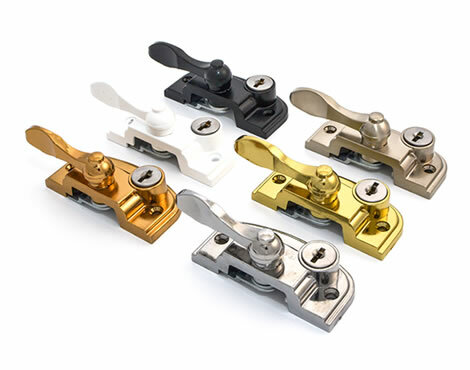 800 series sash locks: Similar to the 9400 and 9600 sash locks, the 800 series (the NL800 and KL800) also provides a locking mechanism which is weather proof, whilst also providing excellent levels of security due to its sweeping cam. The KL800 model in particular features a cylinder lock which offers improved security. 17 series sash locks: An advantage of the 17 series is that they provide a concealed lock, which helps to reduce the risk of dust and dirt getting into the locking mechanism. This serves to improve the longevity of the lock, whilst also providing a better seal at the head of the window. 7538 and 9000 series sash locks: Both the 7538 and 9000 series are especially well suited for slim profile windows. Featuring a low, sleek profile, they are able to fit closely against the window frame to achieve a modern, neat aesthetic.